No one wants to feel like a wallet with a person attached. Customers are individuals and want to be acknowledged that way. From the first day cashiers start working, train them to make eye contact, smile, learn the names of regulars, make conversation and suggest a menu item or extra that enhances the meal. In other words, provide Service That Sells! “Oh, no,” your employees might think. “You snuck in that S-word again. Please don’t make me do it. I’ll smile and serve all you want, but I don’t want to sell!” Remind employees that all you’re asking them to do is suggestive selling — or soft selling. It’s helping customers make decisions, recommending what’s good on the menu, asking questions about what they’re in the mood for, then helping them choose a food or beverage item they’ll like or an add-on that will make their meal taste better. The backbone of successful suggestive selling is product knowledge. How silly do cashiers sound when they can’t name the soft drinks available? They’re not doing the operation any good, either. And such ineptness doesn’t do much for customers’ lasting impressions. Making menu suggestions shows customers they’re worth your employees’ time. It’s perceived as better service and keeps traffic coming through the doors. There’s no better way to build your profits. How do you motivate your hourly employees to embrace suggestive selling? You have to train them to do it, just like you train them to handle cash or operate the fryer. Excerpted from Quick Service That Sells! 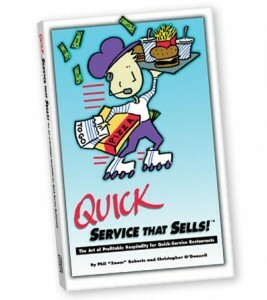 The Art of Profitable Hospitality for Quick-service Restaurants. This must-have book for quick-service owners and managers explores the eight areas that form the foundation of complete customer satisfaction, as well as how to implement the ideas in your operation. Click here to check it out.